Doodling is often seen as a sign of distraction. If you're doodling, you're not paying attention. If you're drawing, you're not taking notes. You're not listening. You're not learning. But research published in the latest edition of the journal Science challenges the anti-doodling stance. 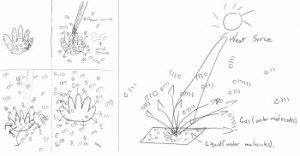 It contends that not only can doodling help students learn, but that drawing is an important tool for scientific discovery. The researchers -- Shaaron Ainsworth, Vaughan Prain, and Russell Tytler -- argue that scientists rely on visualizations in order to make sense of their observations and discoveries. Words alone -- as notes or as longer explanation and analysis -- aren't enough. By extension then, creating drawings is important for all those engaged in scientific inquiry, whether they're scientists or students. "The most striking thing was the effort that students would apply to learning about science when they read and then drew what they could understand from the text." The research suggests that when students draw a scientific concept, such as a sound wave, they understand it better. But just as important as their understanding, perhaps, drawing helps them feel more engaged and excited about learning. "The most striking thing was the effort that students would apply to learning about science when they read and then drew what they could understand from the text, and how much enjoyment they derived from doing this," researcher Shaaron Ainsworth told LiveScience. "This was in comparison to just reading text, or indeed writing summaries after seeing diagrams or seeing pictures and text. In my experience, learning through drawing is often therefore both effective and enjoyable." The researchers make it clear that drawing shouldn't replace other forms of work. Students should still talk and write about their research. Argumentation and explanation are still necessary skills for students to engage in. Furthermore, drawing and doodling need to be in the service of learning. Coloring in a diagram of the digestive system, for example, doesn't help a student understand digestion. This latest research published in the journal Science isn't the only work on the topic, and others have made similar assertions about the value of drawing and doodling. A study published in the 2009 Applied Cognitive Psychology journal found that people had a 29% increase in information retention if they doodled while they listened. And a recent CNN op-ed on doodling pointed to Google -- the only company with a "Chief Doodler" on the payroll -- as a great example of the importance of balancing creativity, innovation, science, technology, and yes, doodling. The researchers from the latest Science article say they'll continue to examine what impact drawing has on the mind, in terms of learning, engagement, and enjoyment. Despite what seems like good news for doodlers, there are lots of other questions that arise from their findings: how does your skill at drawing impact your learning? And how will the rise of new computer technologies change the way we take notes? Many e-books, for example, still make it difficult to take notes in the margins, let alone add doodles and drawings. Will tablets and apps enable this sort of thing? Or is this research another sign that we shouldn't be too quick to abandon the notebook and pencil?